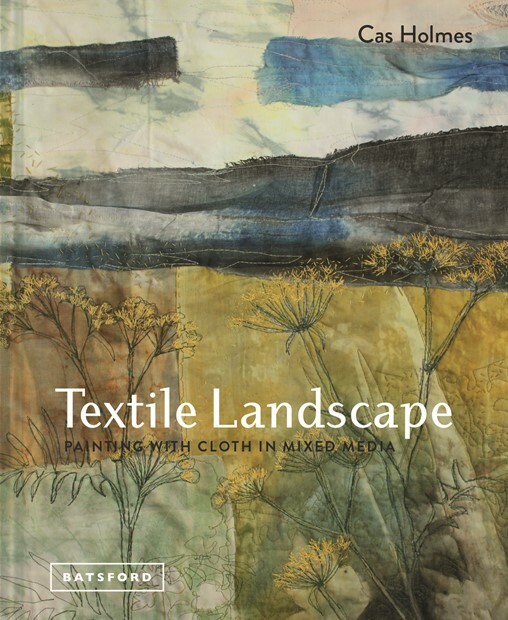 "A Continual Challenge of Ideas"
"Concealed:Art Textiles Made in Britain"
"Textile Landscape launches today 6th September"
Urban Nature I am interested in land as a reference; flora, patterns in nature, the world within my footsteps. 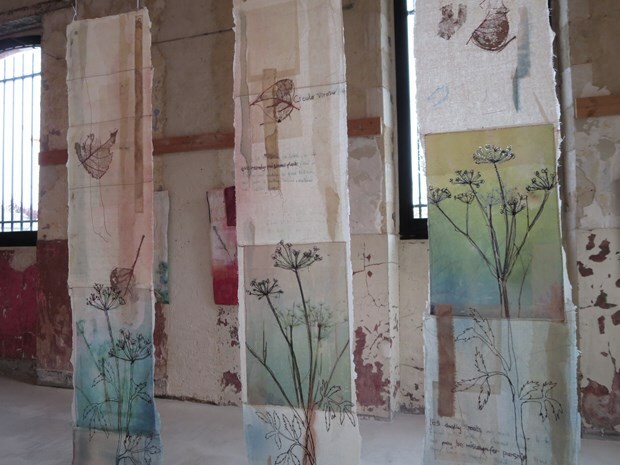 I re-use found materials and textiles, fascinated by their prior history and hands that have held them. My concern is political, social, as well as climatic change. I approach this through the media I use and the connections found in the places I work (personal experiences, connected stories, materials and imagery). Career path Following my degree my understanding of paper and related media was further enhanced through two periods of long-term study in Japan in the mid to late eighties with Fellowships (supported by the Japan Foundation and the Winston Churchill Memorial Trust.) I continued research with an Arts Council Award to India in 2006. I work on commissions and in the public sector in addition to developing my personal practice. The challenge of working on site-specific projects and in workshops offers opportunities for professional development. Commissions. 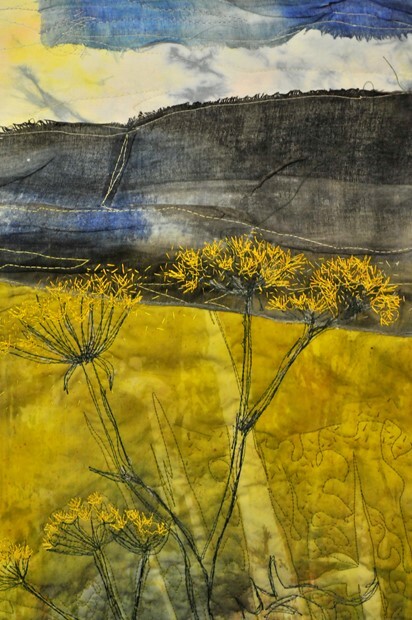 I work to public commission on textile and mixed media projects utilising paint, dye, print, photography and stitch techniques. This includes a project with the Caring Hands a Homeless Charity in Chatham and Farnham Pottery 2017, the Garden Museum, London 2014/5, Sevenoaks Kaleidoscope (museum, art gallery and library) Kent, a commission for the Princess Royal Hospital, Pieces are also held in private and public collections including the Museum of Art and Design New York and the Embroiderer's Guold UK. 2013 Urban Nature Front Room Gallery, Beaney Museum, Canterbury - Common-Place, Maidstone Adult Education Centre. 2017 All That Remains, (Exhibition about the Titanic) Chichester,National Open Textiles Exhibition, Funkey Aardvark, Chester. 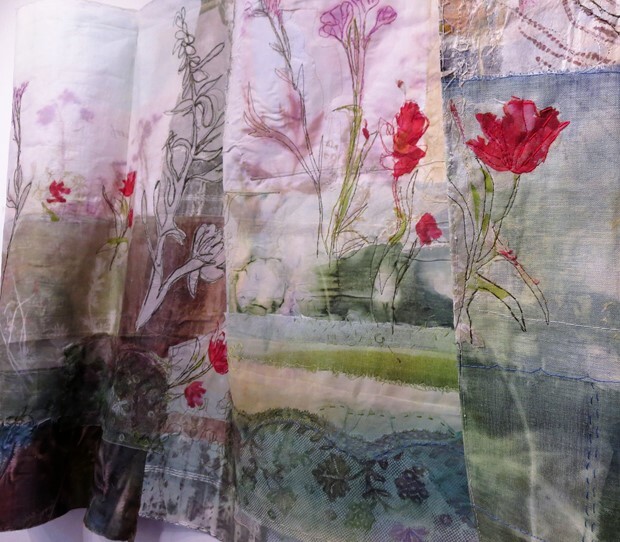 2016-18 Concealed, Art Textiles Made in Britain, Festival of Quilts, Minerva Gallery Wales and Maidstone Museum and Art Gallery. Textil Natur Quiltstar Freiburg. Prescription Templeman Gallery University of Kent. 2016 'Stuff for Thought', Human Rights Office Nuremberg, Pilgrim's Footsteps, St Mary's Church Burham, Coming Home, Installation, Maidstone Museum WW1 exhibition. 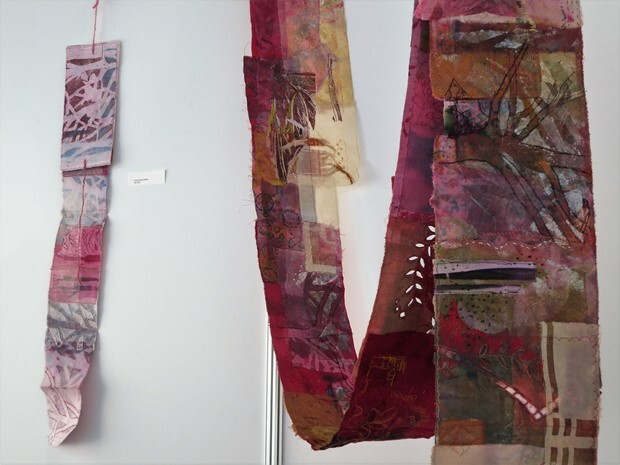 2014 Exposition Australia (organised through Fibre Art Australia touring) - Garden Museum, London - Memory Cloth Lace Museum, Horst - Art Textiles Made in Britain, Festival of Quilts, Birmingham. 1995 -2000 Middlesex University,Fine Arts Department. 2008/11 The Making Organisation, Various South East - Guest Tutor and speaker, Textile Groups and Quilt organisations. 2017 Canine Partnerships fundraising exhibition and project, Unfolding Landscapes, Minerva Arts Centre. Caring Hands Homeless Project, Chatham. 2016 Tea Flora Tales, Kent Wildlife Trust, Maidstone.